How Happy Should Joe Biden Be About His Lead In 2020 Democratic Primary Polls? I’m cheating this week and picking a poll released last Thursday for the “poll of the week,” because it’s about a subject that I (and I suspect a lot of our readers) are interested in: presidential politics. Joe Biden is currently the top choice among Democrats in New Hampshire for the party’s 2020 nomination, according to the poll by the University of New Hampshire. The former vice president was at 35 percent, ahead of Vermont Sen. Bernie Sanders (24 percent) and Massachusetts Sen. Elizabeth Warren (15 percent). Several other figures in the party, including New Jersey Sen. Cory Booker, were in single digits. Those New Hampshire numbers about match the national polls we’ve seen. A January Harris/Harvard University poll, for example, found Biden in first (27 percent), with Sanders in second (16 percent). Biden also placed first among Democrats nationally, at 22 percent, in a SurveyMonkey poll last month. A January CNN poll showed Biden leading President Trump, in a hypothetical general election match-up, by a whopping 57 percent to 40 percent. Sanders had a similar margin. Oprah Winfrey, who has been touted in the press as a potential candidate but does not sound as though she is interested in running, bested Trump 51 percent to 42 percent. It’s February 2018. No one knows who is running for president — Biden has been non-committal while taking steps that suggest that he is keeping that option open — let alone how the candidates would do. But the 2020 primary campaign is likely to start pretty soon after this November’s midterms. And this polling raises two questions. Here’s how I read these numbers. Ignore the general election ones. Even just one year before an election — just before the primaries — those polls don’t really tell you anything. And we’re more than two-and-a-half years out. Polling a hypothetical candidate (like Biden) vs. a real candidate (like Trump) tends to give you wonky results. So Democratic Party actors should not get “Draft Biden” going on account of the polls. What about the primary? Keep an eye on those surveys. (We certainly do.) 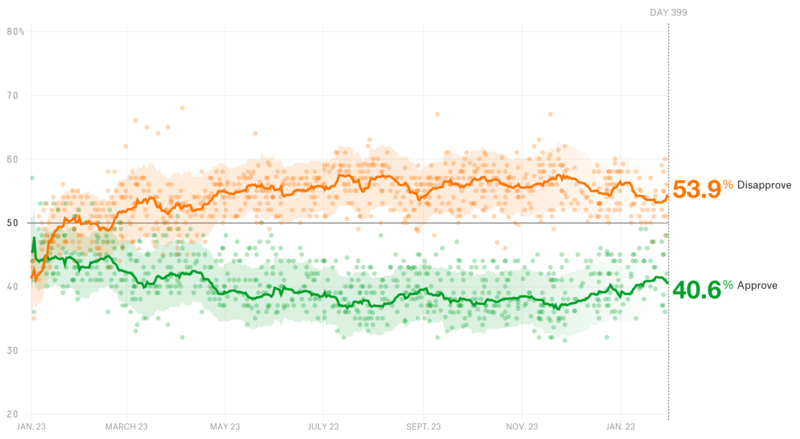 Polling in the high 20s nationally in your party around this time (the period after the previous presidential election and before the next midterms) is not nothing. Biden’s standing is somewhat similar to Mitt Romney’s ahead of the 2012 primaries, John McCain’s ahead of 2008 and George W. Bush’s before the 2000 election. Those candidates all won their parties’ nominations. At the same time, Mike Huckabee in 2012, Hillary Clinton in 2008 and and Rudy Giuliani in 2008 are among the candidates with strong early polling who did not win their parties’ nominations. And Biden is nowhere close to Clinton’s standing in the runup to the 2016 Democratic primary. She had more than 60 percent support for all of 2014, according to the RealClearPolitics average. There are not many clear patterns or rules in presidential politics, in part because the elections happen only once every four years. That leaves us with a pretty small data set. I think the conventional wisdom is now perhaps overly skeptical about well-established figures doing well; people who follow politics closely might have over-learned the lessons of 2008 and 2016, when two upstarts (Barack Obama and then Trump) seemingly came out of nowhere to win their parties’ nominations and then the White House. Romney in 2012 and Clinton in 2016 won their parties’ nominations and came close to being elected president. Biden is far from a shoo-in. He might not even run, and he can’t assume based on the polls that he’d enter the field as the favorite. But he looks like he’d be a fairly strong candidate, at least right now. A quick recap of where the polling on guns stands after the school shooting in Parkland, Florida: A Quinnipiac University poll found that 97 percent of Americans are in favor of background checks for all gun buyers; it also found the highest level of support for stricter gun laws since Quinnipiac started asking about it in 2013. That said, support for gun control measures usually spikes after mass shootings. Additional polls taken after the Parkland shooting have found strong backing for other policies to curtail gun violence — including preventing people with a history of mental illness or people who are on the federal no-fly list from owning guns. People are more split on other measures, such as banning semi-automatic weapons. And Americans are deeply polarized on guns as an issue overall. (We’ll have to wait and see if that changes after Parkland.) For more on public opinion and gun control, see our latest FiveThirtyEight Politics podcast. Only 18 percent of Americans think Trump has been “loyal to his wife throughout his marriage,” compared with 56 percent who think he has not been, according to a Quinnipiac poll. (The remaining 26 percent said they were not sure.) Trump’s marriage has been in the news amid allegations that during the 2016 campaign, Trump’s lawyer paid a woman who stars in adult movies so that she would not come forward and talk about an alleged affair she had in 2006 with the future president. Ahead of the March 13 special election in Pennsylvania’s 18th Congressional District, Republican Rick Saccone narrowly leads Democrat Conor Lamb, according to a new Monmouth University poll. Monmouth used three different models to predict election turnout, and all three showed Saccone with a small lead. Based on turnout in recent special elections, Monmouth shows Saccone with a 49 percent to 46 percent advantage. In that same Monmouth poll, only 40 percent of voters in this Pennsylvania district said they knew that Lamb had said that if he were elected, he would not vote for Nancy Pelosi to continue as the Democratic leader in the U.S. House. Eighteen percent of voters in the district said Lamb’s anti-Pelosi stance made then more likely to vote for him, 7 percent said the stance made them less likely to back Lamb, and 72 percent of voters said the position would have no impact on their vote. A survey of 170 presidential politics experts published this week in The New York Times found that the group ranked Trump as the nation’s worst-ever president, replacing James Buchanan at the bottom of the list. Abraham Lincoln was first; Obama was eighth; Ronald Reagan, ninth. 63 percent of Americans said they approved of how Obama did his job as president, according to a new Gallup poll. Among the 10 most recent presidents, Obama ranked fourth. About as many Germans (16 percent) associate themselves with the anti-immigration, anti-Islam party AFD as the Social Democrats (15.5 percent), the center-left party that has long been the top rival to Chancellor Angela Merkel’s center-right coalition CDU/CSU, according to a new Insa/YouGov poll. 44 percent of respondents said they were satisfied with the leadership of French President Emmanuel Macron, while 55 percent said they were dissatisfied, according to a new Ifop poll. A Morning Consult poll found that a quarter of registered voters said they noticed an increase in their paycheck in the past several weeks as a result of the Republicans’ new tax law. Of those who noticed an increase in take-home pay, more than half said it made them more likely to support Trump and Republicans in Congress who voted for the bill. A Harvard/Harris poll this week asked registered voters to pick their top three go-to sources for the latest news. Thirty percent picked Fox News, 26 percent picked their local news channel, and 26 percent picked CNN. The top six responses were all TV news channels. The poll also showed 68 percent agreed that there is a lot of “fake news” in the mainstream media; that’s in line with polls that have found declining trust in the media. Trump’s job approval rating is at 40.6 percent, while his disapproval rating is at 53.9 percent. Last week, his approval rating was 42 percent, compared with a disapproval rating of 53 percent. 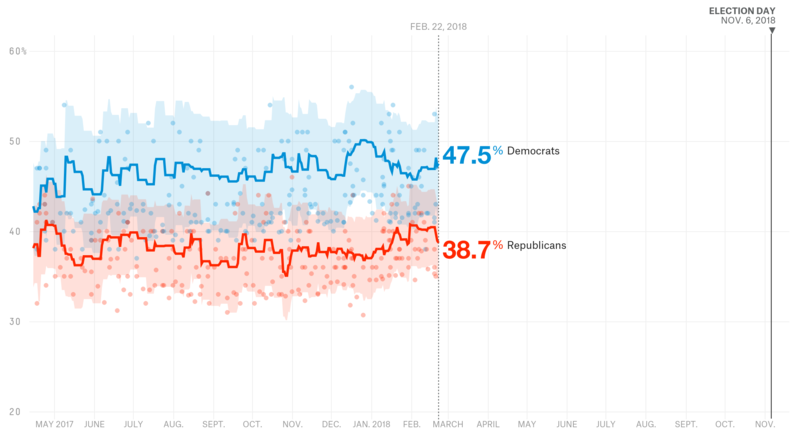 The Democrats hold a 47.5 percent to 38.7 percent advantage on the generic congressional ballot this week. Last week, Democrats were up 46.9 percent to 40.4 percent. In 2015, Biden was hesitant about running, in part because his son Beau was ill. By the time Biden seemed serious about a campaign, many key figures in the party had embraced Hillary Clinton or Sanders.